Remember the picture of the Pratt Whitney Rocketdyne engines that looked an awful lot like a band of Daleks in disguise? That picture may have done a good job of making space shuttle engines look like a bunch of malevolent cyborgs, but there wasn't really anything in the photo to give you a sense of just how impressive these things really are. Six Daleks are en route to NASA&apos;s Stennis Space Center disguised as "space shuttle engines"
Pictured up top is a close-up shot of one of the six engines you saw in the Dalek post [here it is in hi-res, perfect for your desktop background]. It's on its side so that it can be packed up and shipped off to Stennis Space Center in Mississippi, where it will be repurposed for use on NASA's new heavy lift rocket. Shown here is the same engine being loaded into its transportation canister in the Engine Processing Facility at Kennedy Space Center in Florida. Look at how enormous that thing is. 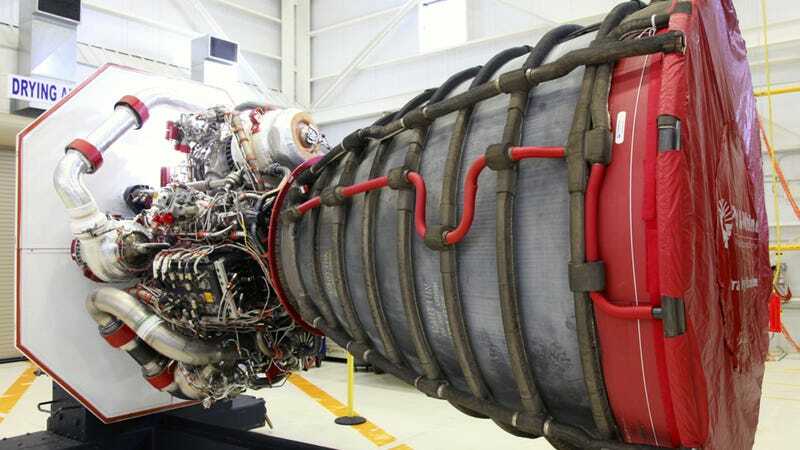 Each one of these engines measures 4.3 meters long and 2.4 meters across, weighs in at close to four tons, and is capable of generating upwards of 400,000 lbf of thrust at liftoff. There will be five of these babies strapped to the underside of NASA's Space Launch System, and they'll be supplementing two, 5-segment solid rocket boosters. This right here, folks, is how we send a citizen of Earth to Mars.